I have long been a big fan of Jackie French's writing-- I still remember taking a copy of Somewhere Around the Corner out of our local library and inhaling it in a matter of hours. Perhaps that was even my first encounter with historical fiction, a genre which remains my favourite to this day. 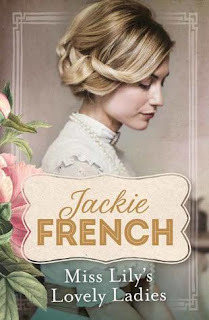 So to discover that Jackie French was releasing historical fiction for adults this year was very exciting for me. I was not disappointed. Miss Lily's Lovely Ladies had everything I could have asked for. It combined the lost world of society drawing rooms, ala Downton Abbey with the meticulous historical research and fresh interpretation of a Philippa Gregory novel, and this book too, I read quickly and compulsively. Though it is not a short book (500+ pages), I read it in a matter of three days. It is the story of Sophie Higgs, the daughter of Australia's largest producer of corned beef, who has money but no 'position' in society. When she looks to make an ill-advised match with the son of a local politician, her father suggests she first spend some time abroad, with the cousin of his business associate, the Earl of Shillings. This cousin is the eponymous Miss Lily, a woman whose influence seems to be everywhere, yet her name appears nowhere in Debrett's. Sophie is charmed by Miss Lily, and soon becomes one of her 'lovely ladies'-- young women who are 'finished' at Shillings and prepared for a London Season during which they will charm and delight, and hopefully, make suitable matches. But there is more to Miss Lily's students than meets the eye, which is entirely the point. Using the skills that they have learned at Miss Lily's knee, the young ladies embark on missions of utmost importance, learning and passing information, and using their influence wherever they can in an effort to ensure that a war with Germany which seems inevitable, never comes. I usually prefer to read novels set during World War Two, but this was a novel which brought the world of World War One vividly to life for me-- not only the horrific scenes of the battlefields at Ypres, but also of the home front, and of the convalescent hospitals fashioned from old country manors. These hospitals become a lifeline for Sophie Higgs when war is declared. Cut off from her friends and family, she finds a purpose in caring for others, and turns her keen organisational mind to ensuring that the wounded soldiers under her care are looked after. Much happens over the course of this book. There is heartbreak, and there is triumph, but regardless of how the story turns out, Sophie is a heroine to cheer for. Hers is a tumultuous life, and she takes it all as it comes and weathers it as only one of Miss Lily's students could. These characters felt as if they could be real people to me, and I enjoyed spending time in their world. Imagine my joy at discovering there will be two more books. Jackie French has captivated me again.